After taking a week off, Broken City Lab Office Hours started up again with a focus on getting a number of the shells for the magnetic planters completed. It was a really productive meeting with some more welcomed new faces and a whole bunch of planters now ready for the next step. It wasn’t all fun though, we lost an invaluable BCL member—Mike’s blender. Continuing with the magnetic planters research, the wild flower seeds have begun to sprout and the development of the planter itself continues. Its strength has held up pretty well, but there are some issues with the wheat paste. So still some work to do, but there’s lots of documentation of the progress so far. Our recipe from the other night produced a much stronger planter, though I think there’s still room to add a coat of wheat paste to the outside. The rare earth magnets do well if there’s two, but I think the best solution will be to adhere them to the outside of the planter, or embed them in the pulp (which would make things a bit more difficult). 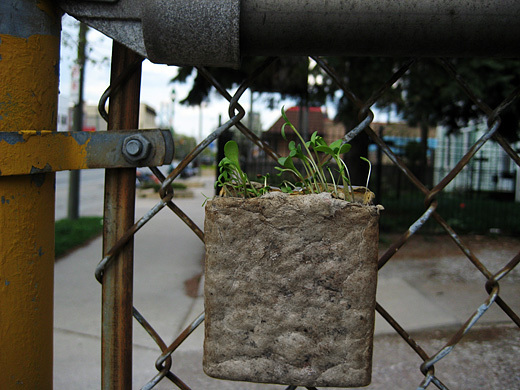 Ideally, we’d use one magnet per planter. This planter is about the size of a cigarette carton, but should be perfect for a sprout of wild flowers or cat grass or something more interesting, with lots of depth for the roots to do their thing. Plus, we’re now thinking that there’s a good amount of surface area to work with for some text / stenciling / recipe, etc. Another cold, rainy Tuesday for Office Hours, but we were inside imagining spring. We pushed ahead on doing some more research and development on the planters, started a plant list and design ideas for the community garden, and got closer to finalizing the list of submissions from Text In-Transit. The wild flower seeds from last year are still good—I planted these seeds on Thursday or Friday and they’re growing like crazy already. The paper planter shaped around the spray paint can lid and reinforced with some wheat paste is holding up, as is the magnet. We have an idea for a better shape and some good suggestions for further reinforcement, and I placed an order for 1/2″ rare-earth magnets tonight, so we’re on track for getting this project off the ground in the next few weeks. More research to do, but I’m excited with where this project is going! Despite the snow, the lethargy onset by exam schedules and year-end assignments, and a few core BCL folk leaving town for the summer, we had a great and productive meeting. We started going through the Text In-Transit submissions, continued working on our magnetic planters, worked on our Rhizome commission, brainstormed the idea of a book, and started to refine our ideas for our community garden (more details on this soon). We’ve been working on paper planters for a while, but over the last couple of days I started experimenting with magnets as well. Ideally, these could work with having some rare earth magnets embedded in the paper. Still more research and development to be done, but I think it’s getting closer. Another week, some more steps forward in our attempts at a planter that can have a magnet embedded in it. While it wasn’t looking like we were making any real progress, this idea came up near the end of Office Hours—plastic cups with holes, paper pulp, and a small cup on the inside to make a mold. I think we’re getting really close to having a workable planter.